The Edmund Fitzgerald was lost with her entire crew of 29 men on Lake Superior November 10, 1975, 17 miles north-northwest of Whitefish Point, Michigan. Whitefish Point is the site of the Whitefish Point Light Station and Great Lakes Shipwreck Museum. 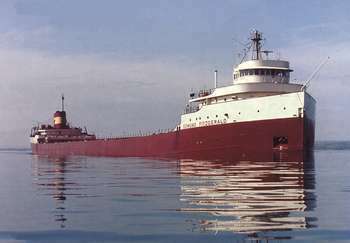 The final voyage of the Edmund Fitzgerald began November 9, 1975 at the Burlington Northern Railroad Dock No.1, Superior, Wisconsin. Captain Ernest M. McSorley had loaded her with 26,116 long tons of taconite pellets, made of processed iron ore, heated and rolled into marble-size balls. Departing Superior about 4:30 pm, she was soon joined by the Arthur M. Anderson, which had departed Two Harbors, Minnesota under Captain Bernie Cooper. The two ships were in radio contact. The Fitzgerald being the faster took the lead, with the distance between the vessels ranging from 10 to 15 miles. Fathom Shoal to the north of Caribou Island. He could clearly see the ship and the beacon on Caribou on his radar set and could measure the distance between them. He and his officers watched the Fitzgerald pass right over the dangerous area of shallow water. By this time, snow and rising spray had obscured the Fitzgerald from sight, visible 17 miles ahead on radar. As the afternoon wore on, radio communications with the Fitzgerald concerned navigational information but no extraordinarily alarming reports were offered by Captain McSorley. At about 5:20 pm the crest of a wave smashed the Anderson’s starboard lifeboat, making it unusable. 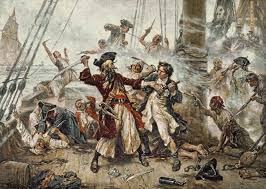 Captain Cooper reported winds from the NW x W at a steady 58 knots with gusts to 70 knots, and seas of 18 to 25 feet. 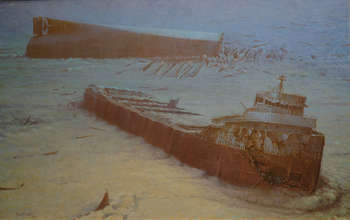 Twenty-nine men were lost when the Fitzgerald went down. There is absolutely no conclusive evidence to determine the cause of the sinking. At the request of family members surviving her crew, Fitzgerald’s 200 lb. 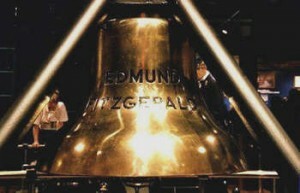 bronze bell was recovered by the Great Lakes Shipwreck Historical Society on July 4, 1995. This expedition was conducted jointly with the National Geographic Society, Canadian Navy, Sony Corporation, and Sault Ste. Marie Tribe of Chippewa Indians. The bell is now on display in the Great Lakes Shipwreck Museum as a memorial to her lost crew.